I've been planning a CD writer made of Lego since I have my NXT. This year's Christmas holidays gave us some time and designed the first version with my son. - motor C lifts the writing pen. My wife just warned me to go to bed therefore I'll post mlcad drawings and photos of this version next morning or so (note it's 22:30 central european time). 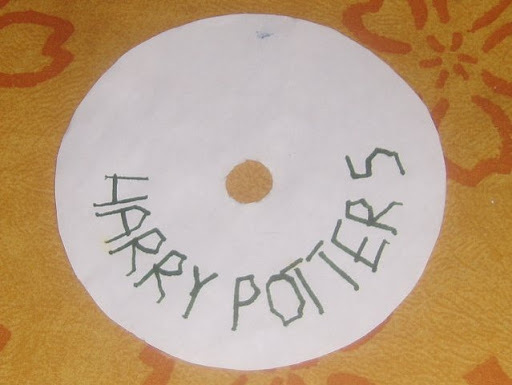 Thwo years ago, or so, I've got a big cake of CD-R disks with inkjet printable white surface. It turned out that my hp5150 mechanics are not strong enough to bend diskette on the same way as the paper. To exploit the beautiful diskettes I've been thinking long ago on a circular plotter that is able to write text and draw simple pictures with a permanent marker pen. Normal plotter writing head is lightweight to reduce the load on the movement mechanics. The pen up / pen down does not need heavy motor. 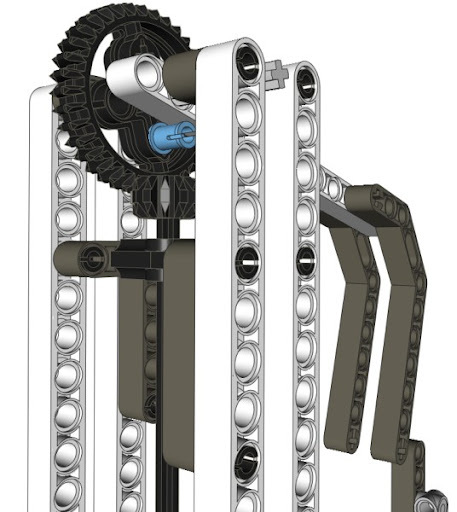 Since NXT set does not contain such lightweight motor we were trying to keep the NXT motors fixed on the base. Resulting achitecture is built on the NXT turntable, pen up/down movement axle is lead through the turntable. 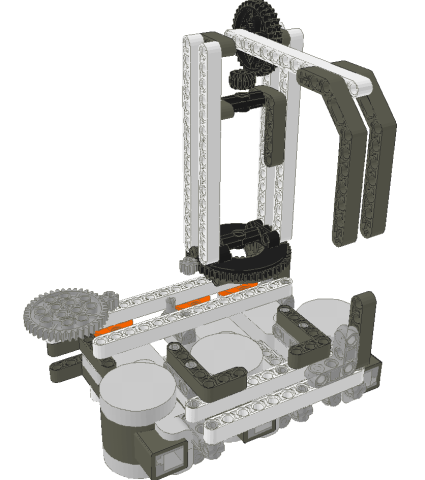 I've uploaded two MLCAD drawings here, will upload more drawings and photos also. 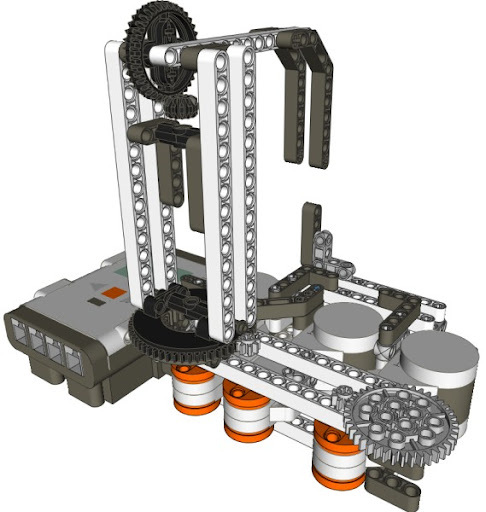 First picture is a general view of an earlier version (deliberately lacinkg most axles and pins). Next picture is a refined pen up/down mechanics. Original design lifted up and pushed down the pen by motor force. This modification uses a pin to lift the pen up. Turning the black gear the ping lets the pen down by its own weight. Leftmost motor (A) drives an axle through the turntable to drive the black 12-tooth bewel. The pin lifting the arm holding the pen is inserted in the 36-gear bewel. Middle motor (B) drives the turntable, gear ratio is 8:56. Rightmost motor (C) drives the CD disk via a gear ratio 8:40. I've used an NXT ballon wheel to support the CD and 24-tooth gear to push the CD on the rubber balloon. I found no appropriate mechanics in the NXT set that could help centering the CD -- so I had to do it "optically." Actually, one of the smallest (non technic) Lego rubber wheels are just perfectly fitting into the inner hole of the CD, but it is not part of NXT set. The laying L shapes are meant to ensure a rigid basement. The single L shape standing upwards on the right front corner is the calibration tip. Sample writing. You can see why I am unsatisfied with the result. Lego components are somewhat flexible. Together with the known loose coupling of lego gears and the non-negligible friction betweenthe pen tip and the surface this resulted in seriously inaccurate writing. Although RobotC offers a variable set nMotorEncoderTarget I was not satisfied with it (or, I was not able to use it correctly) and therefore created a replacement. 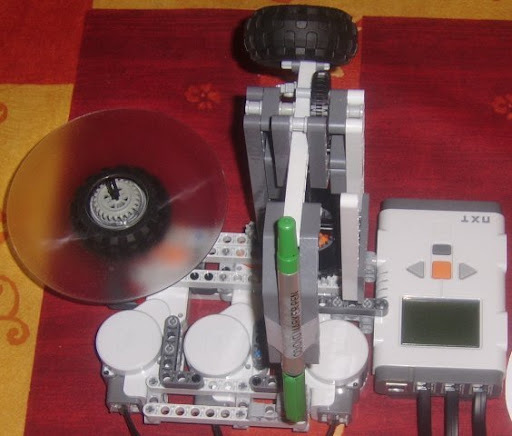 This tasks checks if the motor encoders are equal to the preset target. If difference is detected the motors are started to turn towards the target. Main program sets the target and waits until the motors reach the target. In contrast to a usual robot operations the plotter pen is expected to move from the origin to its target in a straigth line. Thus a simple line drawing algorithm is implemented to ensure a controlled movement of the pen. Having implemented the pen down, pen up, plot absolute and plot relative instructions the plotter is almost ready to work.